Shruthi is from a well to do family. God’s grace is on her and she attains everything she desires. A degree from a reputed college, a great job, supportive parents and the love of her life is also beside her. But then something happened and she was travelling in two boats at the same time. Things were good but then came the doomsday. What happens when the truth is unleashed and trust is broken? Will her life mend? How will Shruthi and her family deal with the catastrophic scenario? I didn’t quite understand the title of the book. I don’t know how to deduce the meaning in a nicer way. And as far as the cover is concerned I liked the shades, I liked the lead and I liked the vast sea in front of her. The cover shows deep images. The balance which the author created by showing a lot of positive and negative leads was great. At every point of time I saw people who were shown with great precision. I loved the changes that came from time to time in the people. From the major characters I loved Shruthi and Rahul a lot. I found great potential in them. They always brought surprises for me by their acts. From the minor characters I liked Meera and Shruthi’s father. I didn’t like Madhan. I found his character highly dramatic. The transitions in him were just showing a male chauvinist. And with a character like Shruthi in hand I didn’t find him equally competent. The narration was average. There was nothing bad and there was nothing extra-ordinary. Things were executed nicely by the author and everything complemented each other to bring out the whole story in larger terms. The short chapters were the lifeline of the book. 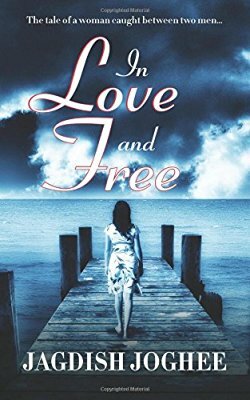 “In Love and Free” is a fictional tale of Shruthi and the level of fiction is well maintained in the book throughout. What I liked about the book is the movement in the story. There was not even one place where I felt that the story was lacking behind. In every chapter there was always something happening and it kept me engaged all the time. I liked the fact that the author avoided extra explanations and kept the book short, crisp and manageable. The first part of the story don’t have much turns and twists but still it helps in creating a perfect background for the upcoming drama. I loved the idea of keeping the chapters short and to the point. This gave the zeal of turning pages without stopping to know what more is in store. I liked the transitions that were shown in the relationships between the couples. They were of high order and also entertaining. The author kept himself away from penning a simple love story and that brought several crests and troughs in the book that made things worthy. I loved the whole episode that happened in Sri Lanka. This was an exciting and well crafted phase. The fact that the author has framed a strong protagonist is helping the story in one way or the other. I liked the fact that the author hasn’t presented Shruthi as a victim in the book. The story revolves around her but the ball keeps changing courts and that makes the characters more lively and this also drifts there traits for good. The middle portion had all the suspense and drama. After that I felt that the end was loose. I didn’t like the proceedings and there was no such moment where I felt great. The story moved and moved and moved and ended. I felt everything was over dramatic after a certain point of time. If and if the end was moulded in a more subtle and less heard way, things could have reached another tangent for sure. Summing Up- The story crafted in the book is nicely shown but I don’t think that it was extravagant. Everything was moving nicely and things wrapped up in an average manner. All in all the entire book was a nice read, with a strong female protagonist. • “If your spouse wants to cheat on you, he or she will. This world is a haven of opportunities. But no matter what, in any relationship, on e must never doubt the spouse. • The simplicity of language. • No point of great nature. • Movement of story in a monotonous way after a certain point of time. The book can be read as a light read for a bit entertainment. Born and brought up in the beautiful hill town of Coonoor in the Nilgiris, Jagdish Joghee has always been attracted to the hills and the forests. His passion for writing started early, during his school days. Jagdish is an active blogger and writes on issues that have a social impact, apart from reviewing Indian movies. He is keen to explore the realm of fantasy.